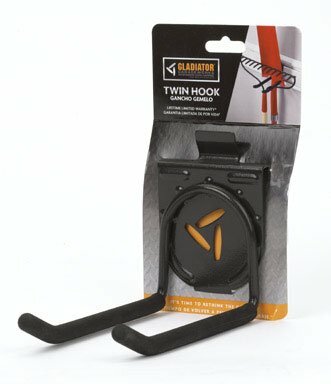 Gladiator GarageWorks GAWEXXTWSH Twin Hook by Gladiator Garage Works at N Online Agency. MPN: GAWEXXTWSH. Hurry! Limited time offer. Offer valid only while supplies last. Sold as 4 UNITS at $7.20 per unit. (1 unit = each.) 25 lbs. capacity. Holds shovels, rakes & brooms. Painted steel with vinyl dipped hooks. Carded . View More In System Attachments. Sold as 4 UNITS at $7.20 per unit. (1 unit = each.) 25 lbs. capacity. Holds shovels, rakes & brooms. Painted steel with vinyl dipped hooks. Carded . Manufacturer number: GAWEXXTWSH. SKU #: 5361480. Country of origin: China. Distributed by Gladiator Garage Works-Whirlpo. If you have any questions about this product by Gladiator Garage Works, contact us by completing and submitting the form below. If you are looking for a specif part number, please include it with your message.